We have now visited Seven four times and feel it is time for a review as we have seen it busy, empty and when you can get a table but still feel it’s buzz. 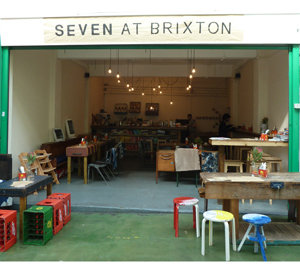 Seven is a Spanish style cocktail bar in the now, less fashionable, Market Row near to Franco Manca. It also serves food to soak up the alcohol. But they also have coffee and it is a welcome quiet haven on a Sunday when Brixton Village is heaving and you realise that you should have booked a seat. Cheap cocktails include dirty martinis, non-orthodox cocktails (bramble comes in a teacup with a cupcake on the saucer) and old fashioneds (spirits, bitters and no sugary fruit additives) as well as Spanish beer. The bartender (who never seems to get a night off) spoke to us each time we visited and is helpful, as well as charming. He explained about all the types of drinks and had time to chat about the food – well on one occasion we were the only customers – but on others, even when we had to squeeze past other diners, we still got a little chat. Decor is quirky. Downstairs we tried out a bench surrounded by heaters, another time we were relegated to a table made out of an old trunk – which if it hadn’t been quaint we would probably have tried to swap as it is hard balancing coffee on such a vaguely curved table with ridges. We also ventured upstairs which is a warren of small rooms each with its own ambience – wall paper with writing on it, low tables, dark romantic looking corners and high bar stools with an accompanying table – take your pick. It is definitely surreal, especially the large anglepoise. But tall people beware there will be a lot of ducking. It is also warmer upstairs when there is a February chill in the air. Quirky is also a word to describe the luggage tag menus which are blessedly short. The suitcase references are a nod to the shop’s past. Food is tapas and the larger sized pinxtos (sounds like pinchos). These you pay for by the stick – £2 each and at the end they add up the sticks – exactly like you would in the some Catalan and Basque parts of Spain. They include anchovy, chilli and tomato, or chorizo and manchego as well as figs and other less usual combinations. There are some hot dishes too but we chose the meat plate to share with padron peppers on the side and a bottle of Rioja (after a cocktail). The Rioja was very good and there was certainly enough food to stop us feeling hungry for the rest of the night. You can spend time here playing games and reading books which are arranged by colour not size or subject. They also have wifi. However, staying too long in the current cold months really requires a few layers of clothes as the whole bar is open to the market. Blankets and heaters help but on one occasion I kept my coat and scarf on.